The Panasonic Lumix G 8mm f/3.5 Lens is a fisheye with an extremely compact form factor suitable for portable Micro Four Thirds setups. The stepping motor is quiet, precise, and good for stills and video shooting alike while the close 4" minimum focusing distance and 180º perspective allows for creative landscape, encompassing interiors, and uniquely distorted portraits. The Panasonic Lumix G 8mm f/3.5 Lens is ideal for experimental shooting, real estate, and vistas. 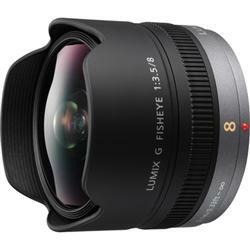 • This lens is compatible with Micro Four Thirds mount cameras. It is not compatible with Four Thirds mount cameras. The focal length equivalent in 35mm format is 16mm.